The helicopter descends down over the fleeing herd of elephants. The dart is expertly fired into the rump of the 2 year old calf. The helicopter pulls back to observe the darted calf. The M99 coursing through his veins, slows the calf to a walk. His mother and sister turn back, trumpeting, urging him to run. The calf stops, swaying from side to side. His mother runs to support him on the one side, his sister on the other. The elephant cow grabs the dart still embedded in the calf and with a scream hurls it into the bush. The calf half falls, but his mother and sister lift him up. The mother elephant extracts water from her stomach and sprays the water into the calf's face. (elephants are the only animal that I know of, that can physically extract water from their stomachs). The calf falls and his mother immediately tries to lift him, but this time his legs are gone, his consciousness fading. The helicopter moves in to scare off the elephant mother and sister. His sister runs for her life, but the mother wont leave the calf, she is too closely bonded. The helicopter turns for a second attempt, the cow slips under the chopper, trying to grab the skid with her trunk, trying to pull the helicopter out of the sky. The helicopter turns for a third time and this time the cow leaves her calf and runs after the herd. As she runs, I see the dark stain down her temporal gland. Is this from the stress or are those tears flowing from her eyes, I wonder! I have just witnessed one of the most intelligent animals on his planet trying everything she knows to prevent human beings stealing her calf from her. Later we would airlift young calves underneath the helicopter and project the images across the world on a program called ABC Sports Wild World of Sports. The press heralded us as great creative conservationists. We were saving baby elephants that would have been culled. The year was 1978. Th place was Kruger National Park South Africa. The following year the price of the elephants calves had doubled because now Kruger Park was selling to international zoos and circuses. (Kruger Park had a policy that the elephant population should be held at 7 000 elephants. Ten percent would be culled annually, the ivory would be sold on the international markets and the meat processed in a factory situated in Kruger Park). Today, 35 years later, the situation is very, very different. We know that elephant cows that have lost their calves, grieve for long periods of time. The trauma and pain is extreme, easily on par with a human mother that has lost a young child. We know that conditions in zoos and circuses are totally unacceptable for a large, social animal like an elephant. We know that elephants calves separated at a young age will suffer irreparable trauma and social imbalances in later life. Therefore the decision for Zimbabwe to sell 30 elephant calves to China (the deal is actually 200 elephant calves) is barbaric, cruel and unethical. In all the countries I have filmed, China is by far the most cruel. I have seen dogs thrown into tiger pens, while Chinese bet to see which tiger will catch the dogs. I have seen bears in cages so small, they cannot turn around, while the Chinese extract the bile from the gall bladder. I have seen cruelty in China so shocking that I could not pick up my camera and record what was in front of my eyes. 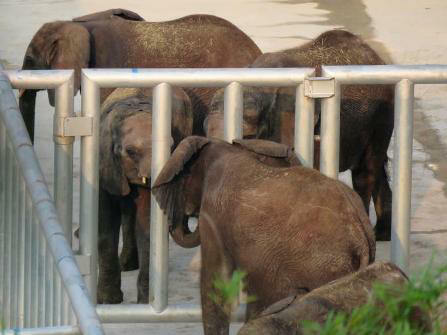 The Zimbabwe Government knows about this cruelty and yet they still go ahead and sell 30 elephant calves to China. The Zimbabweans will pay dearly for this act, of this I have no doubt. Nature works in strange ways. Some people call it "karma". PS. In a fit of anger, I called for a boycott on visiting Zimbabwe. However in retrospect, why should innocent Zimbabweans suffer because of the greed and cruelty of their government. Therefore I retract this statement and encourage people to visit Zimbabwe, beautiful country that it is. The film "Blood Lions" has again brought into focus the cruel, unethical practice of trophy hunting of captive bred lions in South Africa. Thirty years ago this barbaric practice was started in the province of the Free State. Neither the Apartheid Government nor the ANC Government have done anything to stop canned lion hunting. Both these governments have more than enough power to eliminate canned lion hunting and they have done nothing! South Africa as a nation ranks alongside China as extremely cruel. Some of our farming practices, our canned lion and tiger industry and some of the zoos that are allowed to operate in South Africa, are barbaric! However the animal activists that have fought long and hard to have canned lion hunting banned forever, need to think the problem right through. Let us say they are successful in getting canned lion hunting outlawed. They would be signing the death warrant on some 7 000 captive lions. The ruthless people that breed lions for the canned lion industry, have no emotional attachment to those lions. A lion is an extremely expensive animal to keep alive. Once the breeder has no market, they will eliminate those lions and they will do it quickly. There is nowhere for these lions to go. No zoos, no game ranches, no game reserves. They become an instant liability. Here in South Africa, many areas which have failed economically and agriculturally, have suitable habitat for lions. However, these areas need to be bought, fenced, and stocked with game before the lions can be released. This takes millions of dollars and it takes time. I know, I have been doing it for the last 15 years of my life. One minister described "the canned lion industry as a cancer". Perhaps the cancer has spread too far for it to be cured. However one thing is certain, if canned lion hunting is allowed to continue, lions die. If it is outlawed, lions die!